Emus (Dromaius novaehollandiae) are flightless birds, much like the Ostrich. The emus reach over six feet tall and weigh between 66 – 130 pounds. The African ostrich can grow to almost ten feet tall and weigh 220 to 350 pounds. 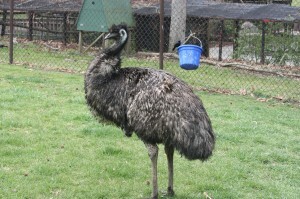 Emus come from Australia, have a long neck, long legs, and small wings hidden under loose, hair-like plumage. Emus can run quickly and can also swim. They have three toes on each foot (Ostrich have two toes.) They feed mainly on seeds and berries and will live in flocks with dozens of others. The female will lay between a few eggs to dozens. It is the job of the male emus to sit on the nest until the babies are hatched and then he will stay with the young for up to eight months. Our current emu, Ernie, was born in the mid 90’s and came to Scovill Zoo from the Henry Vilas Zoo in Madison, Wisconsin. Our emu is fed a basic diet of high-protein dog food, and he also will eat leaves and grass. The enrichment that he responds best to is misting and receiving attention from keepers.